The second most inhabited island of the Canary Isles (after Tenerife) has a character of its own, with a diverse landscape. The shore line varies from the golden sand dunes in the south to the high rocky cliffs in the west. Inland you can find green valleys and attractive villages. 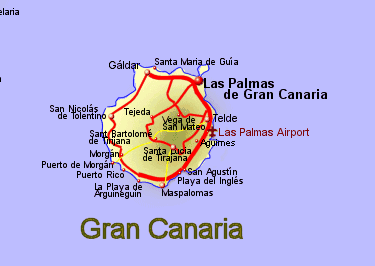 On the map, Gran Canaria is instantly recognisable as being almost perfectly round in shape. As with the other Canary Islands, it is volcanic in origin, with the extinct volcano standing at an altitude of 1949 in the centre. Over one third of the area of the island is included in protected areas, 32 separate areas in total, mostly in the central and western parts, including 2 Natural Parks and 6 Nature Reserves. Gran Canaria has a lot of sporting activities to offer. On the sea you can go deep sea fishing or dolphin spotting. On the coast you can swim, scuba dive, surf, windsurf. Inland you can walk, cycle climb, or just enjoy the countryside. The climate in Gran Canaria is similar to the other canary islands having surprisingly little difference between summer and winter temperatures, but it is also known to have many micro-climates due to its varied landscape.